State lawmakers on Beacon Hill went small on clean energy, but Environment Massachusetts is thinking big. On July 31, the Massachusetts Legislature gave final approval for a clean energy bill that was well short of a home run. 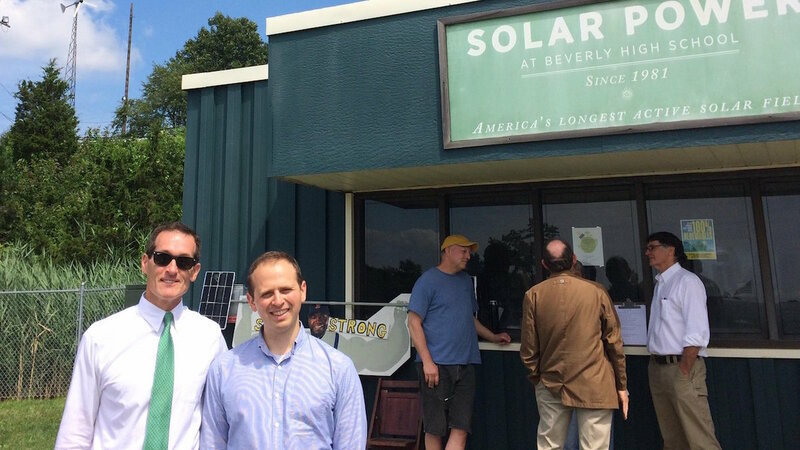 The same day, our staff headed to Beverly to visit the nation's oldest active solar field and promote the 100% Renewable Energy Agenda developed by Environment Massachusetts Research & Policy Center. We were joined by Beverly Mayor Michael Cahill, whose city is leading the way toward a renewable future, with major solar energy projects in the works. "We're not going to make Massachusetts a clean energy leader by thinking small," said Environment Massachusetts State Director Ben Hellerstein. "When the Legislature gets back to work in January, we'll be ready to offer them an ambitious energy agenda." The 100% Renewable Energy Agenda includes more than 30 policy proposals to reduce energy consumption and repower all sectors of the economy with clean energy.